How to make agency’s social media approval process flawless? How many e-mails can clog your mailbox every day? For me, I could have just counted it in hundreds not that long ago. Some of them concerned issues as little as changing one word (“great” instead of “good”) in a post I sent for approval. Can you imagine exchanging even twenty e-mails with eight people in CC who argue about one letter? This is when I realized that social approval should be a piece of cake: easy, short as for time to consume, and relatively sweet. Since then, I decided to define and constantly develop a workflow for simple online team collaboration. With a little mix of procedures and tools, I created a machine that works wonders. Today, I am going to reveal some of those secrets that helped me manage over 100 social media accounts for clients from different industries, time zones, countries and work preferences. How to be in charge of numerous social media profiles and not go crazy? I kept asking myself this question almost every morning when I was woken up by my clients from the other side of the world, and almost every evening which I spent on exchanging e-mails with those clients. I was doing well, but I knew I could do better with my content calendar and social media approval. If you work in social media marketing and you are going through something similar (thinking how on earth you haven’t gone crazy yet), you are probably on the brink of collapse. Keep on reading to find out how to fix that. When it comes to marketing, a strategy can be compared to Voldemort from the Harry Potter saga. Why? Well… Everyone around knew he existed, a lot of people read about him and almost everyone knew his name, the majority was scared of him, yet not many really faced him in person or actually got to know him well. Exactly the same things happen with marketing strategies. Horcrux was a thing that could have weakened Voldemort, and lack of a workflow approval process could easily be that Horcrux when you work on a strategy. It’s not too late to change that, though (another thing is that if you don’t have a strategy yet, our recent article may come in handy). You need to take care of a few things first before you start implementing approval workflow externally and internally. Simply ask yourself a good set of questions and seek answers from involved sides. Who is in charge of the whole process of creating posts for each and every client? Or, more precisely, who the social media team consist of? Who is responsible for what part? For example, a graphic designer can’t do anything without a brief from a social media specialist, but social media specialist needs to work with a strategist to make sure the communication is consistent. Make an e-mail intro / Skype call / meeting between a client and the whole team. Why? Sometimes when the dedicated graphic designer gets familiar with a brand and people, they may create more accurate promotional materials, knowing the corporate culture and requirements a little bit more. Who plays the role of a supervisor, both on the agency side and the clients’ side? Who checks prepared content? 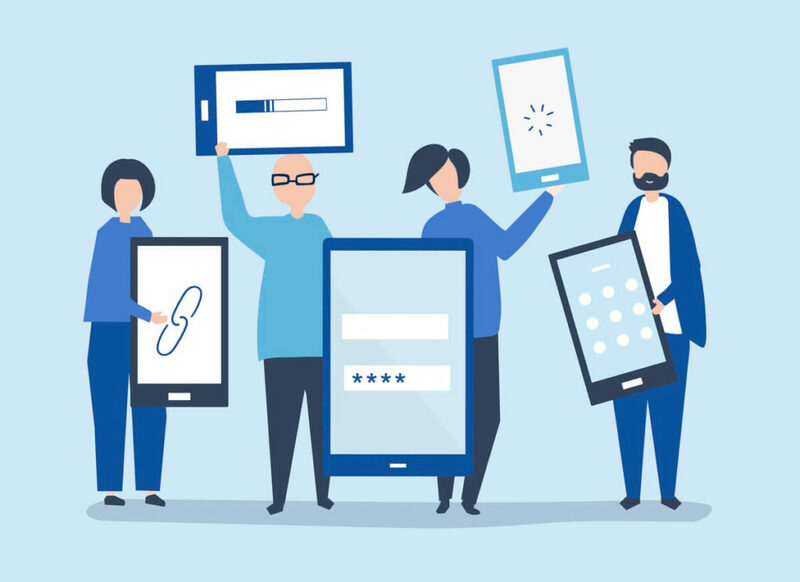 On the agency side, it is often a content manager or account manager who takes a final look at what is prepared by social media specialists, graphic designers or even interns. On the client’s side, there should be a dedicated person who would say “I approve of this post”. The more people are in the pipeline, the more troublesome and longer the process can be. If you would have to fight for each approval, the process can take ages (everyone has at least a few responsibilities, and some tweets may not exactly be a top priority for Very Important (and Busy) People you work with). What are the exact responsibilities of each side? Who is responsible for doing research? Who and how delivers materials? Who is in charge of communication during weekends (if anyone)? What are do’s/don’ts for each brand you manage? What are good practices you should apply, and mistakes you need to avoid? Adding a logo in the top-left corner can be desirable, whereas using a particular hashtag might be forbidden in the communication. These elements vary, depending on a brand or a social media platform. What are the deadlines for sending content? When, at the latest, the content should be delivered and approved for smooth social collaboration. What tools do you use to manage communication? As long as there are some hidden tools your agency can use, it is worth implementing some tools for collaboration between your team and clients. The latter group can be a bit hesitating as for implementing new tools, however, with a little persuading you can prepare onboarding. Clients are often scared of new solutions and they don’t want to waste their precious time on tutorials. 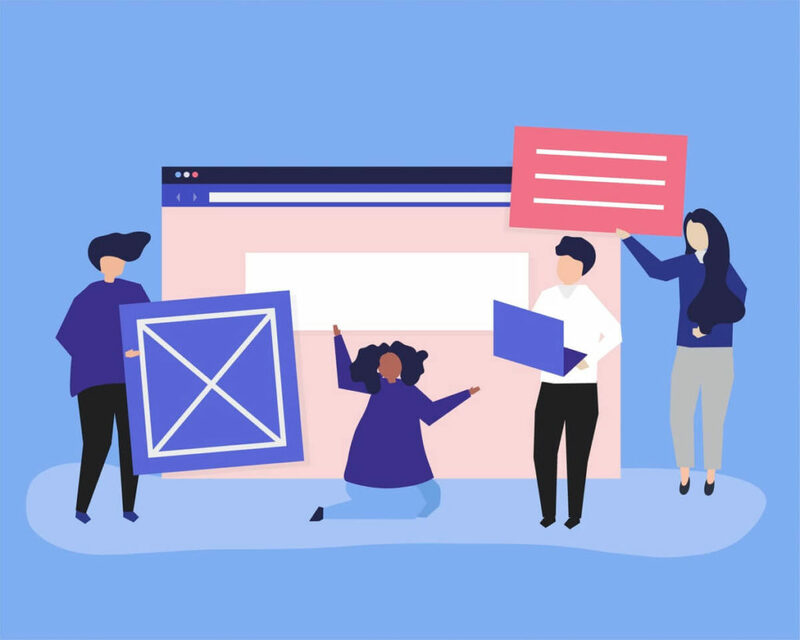 Others prefer traditional forms of communication, so whichever tool you chose needs to be simple and user-friendly, and bring benefits not only to agency’s productivity but also clients’ workflow. Kontentino, for one, allows clients’ to approve content with just one click, using a mobile app. 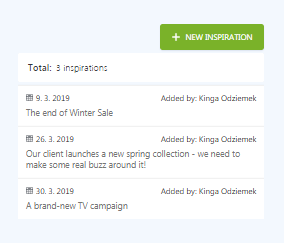 To speed up your process (and, therefore, meet all deadlines), you can put some inspirations, important dates and events related to a brand in Inspiration calendar, e.g. in Kontentino. How do you cope with crisis management? How do you react to complaints? How do you identify a crisis? What is the response time, especially during weekends or evenings? If the crisis escalates, what are the next steps? You simply have to define it all, before someone starts the fire. Social media have no mercy, and if someone wants to complain at 11 pm, they can do it. The question is: how will you go about it? Put your procedures in the form of PDF and redistribute to everyone in the organisation and on the clients’ side. You will always have something to come back to in case a crisis happens! What platforms do you use for communication? Specify those profiles and platforms you are in charge of, especially if your client hired a few agencies before (or you’re still not the only agency working on their profiles). This is also a great step for gaining all of the materials, files, and passwords that may be found anywhere but not where your team needs them. Speaking of your team – once you get the aforementioned procedure ready, it’s time for making the social media collaboration magic happen! Of course, you should get your team all together and introduce them to all of the procedures. You should keep the guidelines at hand in case of onboarding of additional employees. There are a lot of things you can do to build a special bond between your team and clients, but it should all start from providing employees and colleagues with necessary materials, passwords and corporate culture story. The more your employees get familiar with a brand, the better content they will deliver. Giving them only a name and a website won’t do the trick. What should everyone keep in mind before they ask for approval? Tone of voice – each brand has its tone of voice, even if it is not officially defined. Your team should know how they should communicate on behalf of the brand. Brand book – each brand has a set of colours or fonts they use. If you use just „blue” in your graphics, without following a given colour, you can face your client’s anger and lose a lot of time on approvals. All types of guidelines. Guidelines are nothing to argue about but follow. Even if a particular brand wants to be titled as a “service”, not a “platform”, it is a part of the rules. The same applies to guidelines for the quality of published content. Language. Controversial wording or grammar mistakes won’t make an expert and reliable business partner out of you. You may think these are only some “typos”, but they say a lot about the quality of work delivered. Before you send any of your pieces of content and request approval from your clients, double-check them! Send for clients’ approval something you would approve without any doubt. If there is anything that may not meet their requirements (for example, the graphic design contains a lot of red colour – and Facebook destroys its quality as it is red – don’t send it to the client and get the excuses ready, try to work on it and send a final version instead. Changes are usually good but it can be difficult to adapt them at first – especially if some processes changed drastically. 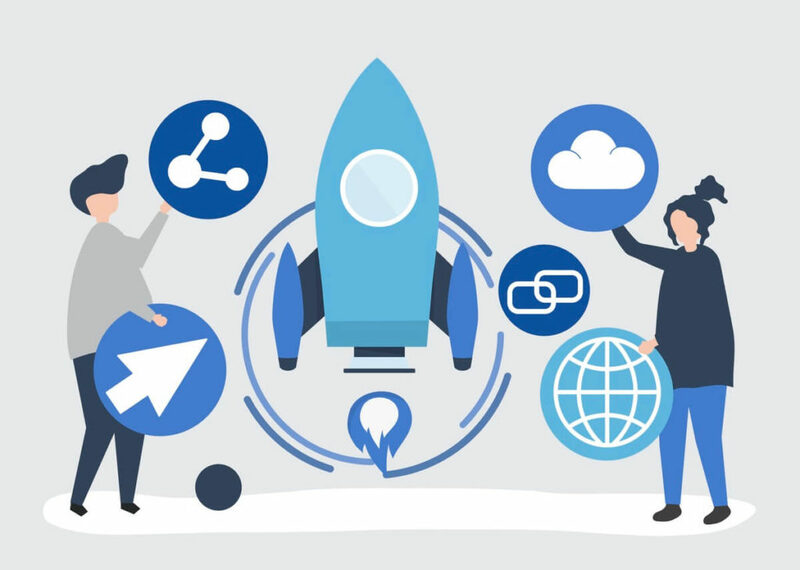 The first days are likely to be full of mistakes or confusion, but you are able to overcome them to keep your online team collaboration in shape. It can also be tricky to keep an eye on everyone if you are a distributed team and work remotely, not only with your client but also with each other. 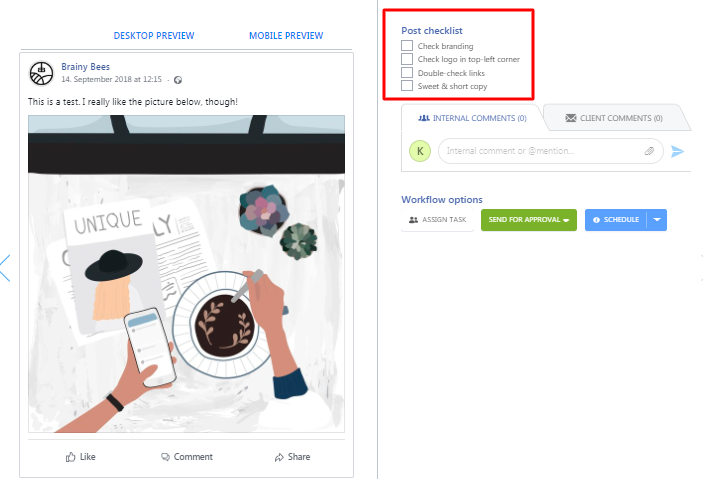 It sounds like a beautiful mess, but below you’ll find a few useful tips on how to make the most of Checklists, for example using a social media approval tool, like Kontentino. when new changes are implemented and you need to introduce them to the whole team while ensuring a high level of delivered materials. when you hire some interns/juniors who are thrown at the deep end and need to take care of communication from day zero – yes, it happens! when you haven’t developed a huge onboarding process yet. In Kontentino, you can customize them as you want, depending on your needs, requirements and projects. Once a person in charge of preparing a particular post assumes it is done (so all fields on the checklist are marked), they can send it further, i.e. for internal approval. It all happens within Kontentino, and the whole communication is kept in one place. Forget about e-mails, text messages or pinging on Messenger out of your working hours. Do you remember when I said that getting clients’ approval can be a nightmare? If you take the steps mentioned above, the whole process before you press “send for approval” will be easier. 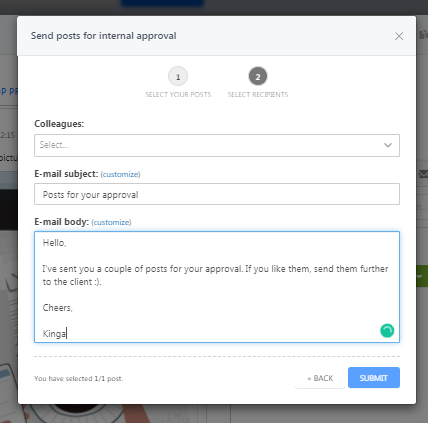 But how to make the post approval process itself equally simple? Approval queue can be a time-killer, and awaiting approval may cause problems. Whoever tried to push some communication, especially in real time, knows that every minute counts and can decide on the success of a particular post. This is why clients’ approval should be smooth and quick, for both sides. Clients do not really want to dig in spreadsheets or open files they don’t understand. They need a simple message with content to approve. Sometimes clients do not require approvals, and that’s great. 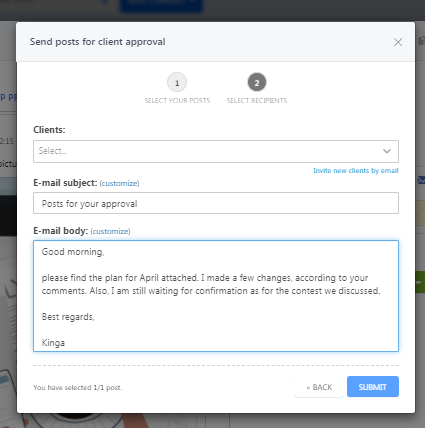 However, it is always safer to send posts for approvals, especially if it is as easy as in Kontentino. Why? In the case of unexpected events, like a social media crisis, a particular piece of content can be a troublemaker if it wasn’t approved by clients first. If a particular piece of content is thoughtfully prepared and approved internally, it can be sent the same way to a client. When doing this in Kontentino, not only you keep all of the communication within one platform, but also avoid missing some messages, e-mails landing in spam or calls at 11 pm. Clients can comment on your content or approve it with just one click (even if they are far away, with an intuitive mobile app). All team members will get a confirmation of approval of the social media content, too. To increase your team productivity, you can use Clockify.me to measure how much you spend on each task. Then, you can identify what is the pace of work and optimize it in your team. If you think you have just mastered your social media approval process, well done! However, there are still quite a few things you could do to make it work even better, quicker and more efficiently. Use team collaboration platforms. As it was already shown above, automating a process in terms of social collaboration can be a game changer and time-saver. Constantly ask your clients for feedback. For example, there may be just one thing you haven’t already spotted, but it makes your client send a few posts for rework all the time. Be always prepared. You never know when you need to work on posts again, change something, add some details. Store securely some data about each brand, have the whole package of logotypes and fonts at hand, and some minor corrections can be fixed in no time (so that the whole workflow, including approval process, still goes smoothly). Keep an eye on your posts’ performance. You need to find a golden mean between what you prepare and what really performs. At the end of the day, it is a business goal of your client what matters the most. Kontentino supports another thing for your clients, too – it can help you generate reports that are simple to understand and pretty to look at. Don’t be scared of introducing some tools to automate processes. With Kontentino, you can automate your journey with social media content from conception to completion, including clients’ approval. And they seem to love it! Sorting out social media management together with your team and clients is a challenge and process that may take months to complete. However, it pays off quickly with increased efficiency and productivity, and pure satisfaction of peace of mind. You can tell that work on social media can be beyond stressful, but you can make it easier and simply calmer with appropriate social media management procedures including clients’ approval. Knowing that your clients saw and approved content you prepared is precious for successful communication. Owner & Creative Director at Brainy Bees. She believes that insights are everywhere!